KARACHI: The provincial government has approved new agriculture and youth policies, besides approving setting up of two universities. 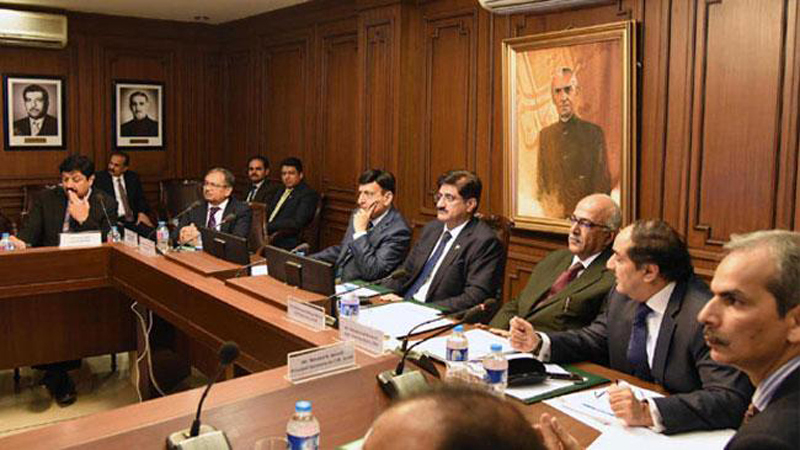 These decisions were taken in the cabinet meeting chaired by Chief Minister Murad Ali Shah. The agriculture policy has been framed after a series of background studies on macroeconomic factors, poverty and gender, climate change, value chain enhancement, resource use efficiency, nutrition and fiscal space utilisation, in addition to consultation with farmers and stakeholders. The time horizon of the agriculture policy will be until 2030, in line with the internationally agreed sustainable development goals. However, various legal, regulatory, institutional and expenditure-related changes set out in the policy would be implemented over a period of 2018-20. Further, Shah said what little growth had occurred was a result of more land, water, and input, higher livestock numbers or greater fishing effort. He said that such an input-based pattern of growth was not sustainable. For example, he said it was estimated that by 2025 water requirements for agriculture would increase by about 50 percent if current irrigation practices continued. “In coming years, enhanced productivity has to take over as the principal engine of growth,” he added. Minister Home and Agriculture, Sohail Siyal giving details of action points under the new agriculture policy, said that it will increase credit flows into crop, livestock and fisheries and for associated rural off-farm activities, including development of new instruments such as warehouse receipts and building linkages formal and informal sources of credit. To simplify procedure for land use, land transfer and lease for establishment of rural enterprise will be introduced. Legal and regulatory system governing agriculture and livestock marketing will be reformed and price support system redesigned. Efforts will be made to improve legislation, regulations, labelling and quality oversight in market for inputs, particularly for seed, fertilisers, pesticides, animal feed and veterinary medicines, as well as for certification system for organic crop, livestock and fisheries products. To attract investors both domestic and foreign to rural areas through fiscal incentives, a better legal/regulatory environment will be established for commercial farming, cold chain and agro-based industry. This will also help promote export of high value food production. Policy will review and reallocate government expenditure on agriculture as well as on direct and indirect subsidies. To restructure, right-size and rationalise them, government departments concerned will be made `fit for purpose’, avoiding duplication of efforts with improved conditions. Policy will contain measures to reform public research and extension system for crops, horticulture, livestock and fisheries, particularly their governance mechanism. Local Government Minister Jam Khan Shoro emphasised on the need for giving more subsidies to the agriculture sector. Meanwhile, the Sindh Youth Policy is a central tool to systematically integrate, implement and evaluate all youth development work in the province. It aims at building a youth force that is economically sound, socially progressive and politically engaged and that possess appropriate skills and tolerant values of good citizens. Like agriculture policy, it has been formed in consultation with stakeholders, experts and academics, the cabinet members were informed on Monday. The policy includes provisions for establishment of a youth development commission, establishment of district structure of youth affairs department, centralised information system on youth development and a jobs database, establishment of Institute Placement Bureaus through IT interface, establishment of youth venture capital fund, annual innovation competitions and formation of small incubation centres at universities, entrepreneurship training at universities by private sector, crash programmes of technical education, research and mapping studies on youth, youth-led mass awareness campaigns, elected student councils, exposure trips, reactivation of students unions, establishment of artisan support programmes, and reactivation of boys and girls guides at school levels. The cabinet also decided to upgrade Shikarpur Campus of Shah Abdul Latif University as a full-fledged university. The cabinet approved the draft of Shaikh Ayaz University, Shikarpur Act, 2018 and referred it to the Assembly for approval. The cabinet also okayed establishment of Begum Nusrat Bhutto Women University draft Bill, 2018. The university is being established in Sukkur with a cost of Rs 2,710.6 million. The land for the university has been donated near the Arts Council, Sukkur, and its compound wall has been constructed. The construction work is in progress and its vice chancellor, Parveen Munshi has been appointed to look after the establishment. The approved draft bill has been referred to the Sindh Assembly. Further, the cabinet approved appointment of Ayaz Hussain Tunio as the new prosecutor general. On recommendation of the Chief Justice of Sindh High Court, the cabinet repatriated Mushtaq Ahmed Kalwar, a district and sessions judge, working as the presiding officer at the Sindh Labour Court No VI, Hyderabad. He will be replaced by Abrar Hussain F Memon, a DSJ serving at a Labour Court in Larkana. The Chief Justice was requested to nominate a presiding officer for the labour court in Larkana. The Sindh assembly had passed a bill regarding regularisation of NTS pass teachers appointed on contract basis and sent summary to the governor on February 26, 2018, for his assent. The governor returned the bill with observations that contractual appointments of teachers under the policy of 2008-12 were made to address the issue on non-availability of teachers at union council/taluka levels. These appointments were thus made area specific. The passage of bill categorically killed the spirit of the policy which was meant to revive the teacher deprived schools of far flung areas of Sindh. On Monday, the cabinet after addressing observations made by the governor referred bills back to Assembly. The cabinet decided that teachers transfer/posting would be made in such as way that no school remain deprived of a teacher. The transport department moved an item for approval of cabinet regarding fare slab for operation of AC buses on intracity routes in city. Transport Minister, Syed Nasir Shah told cabinet that fare has been proposed in consultation with all stakeholders at Rs 20 for less than five kilometers, Rs 30 for five to 15 kilometers and Rs 40 for 15 and above kilometers. These 10 buses would operate on routes via Quaidabad, Malir, Star Gate, Shahrah-e-Faisal, Shah Faisal Colony, Natha Khan, Drigh Road, PAF Gate, Karsaz, Baloch Colony, Nursery, Jinnah Hospital, Metropole Hotel, Fawara Chowk, Arts Council, I.I Chundrigar Road upto Tower. The cabinet approved fare slabs and urged the minister to start the bus service. The cabinet also made some amendments in Sindh Sports Board. Earlier, it was headed by Governor and now it would be chaired by Sindh Chief Minister while Minister Sports would be its vice chairman.